This provides a different view of events seen in the chamber and an opportunity to get quantitative, using the on-screen tape measure. See the description of the projection view and this event below. The screen shot above shows the projection (in the plane perpendicular to the magnetic field) of an event in which a pion enters from the left and decays into a muon (large circle), which subsequently decays into an electron (circular arc starting from lower left of big circle). Invisible neutrinos can be inferred by momentum and energy conservation. The interactive tape measure (red line) has been stretched along the diameter of the muon track. Its length (166.1 cm) scaled to the selected chamber size can be seen on the right. Two other planar projections are also available. The three-dimensional view of the event displayed in the projection view is always only a menu selection away. The radius of curvature measurement leads directly to the momentum in the plane shown. An on-screen "Reminder" window shows the equation you need and points to the measurement you need to make. 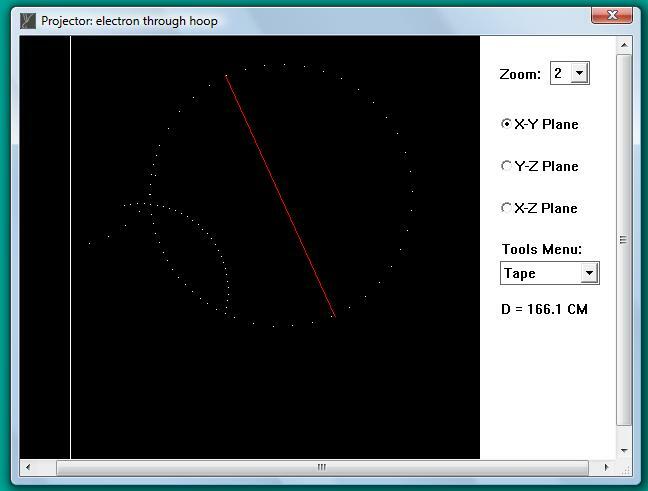 The Trackmaker simulation of charged-particle motion in a magnetic field makes this reasonable to your students. Students find this direct experience with the physics is very satisfying. It is also educationally effective. We learn best by doing, and how else do you do particle physics at an elementary level?